Providing roof cleaning services in the Seattle tacoma Washington area. We have been in business since 2008 and hope to continue to be in business many years in the future. Roof Mold removal is PWNG specialty. Most people seeking a roof cleaning,cedar roof restoration or deck restore do some research on a business before actually calling. Seattle is home to the most tech savvy consumers in the nation. Bellevue is home to many professionals who are accustomed to diligently checking references and using friends and family as their source for home improvement recommendations. This deck was covered in algae. It took 3 washes with oxygen bleach and an oxalic acid treatment to restore it. Here the power of experience comes into play. The use of per-carbonate cleaner before a power-wash was the only way to effectively remove the deep stains. A light coat of sodium hypo helped kill moss. The final step in a restoration is applying an oxalic acid treatment. 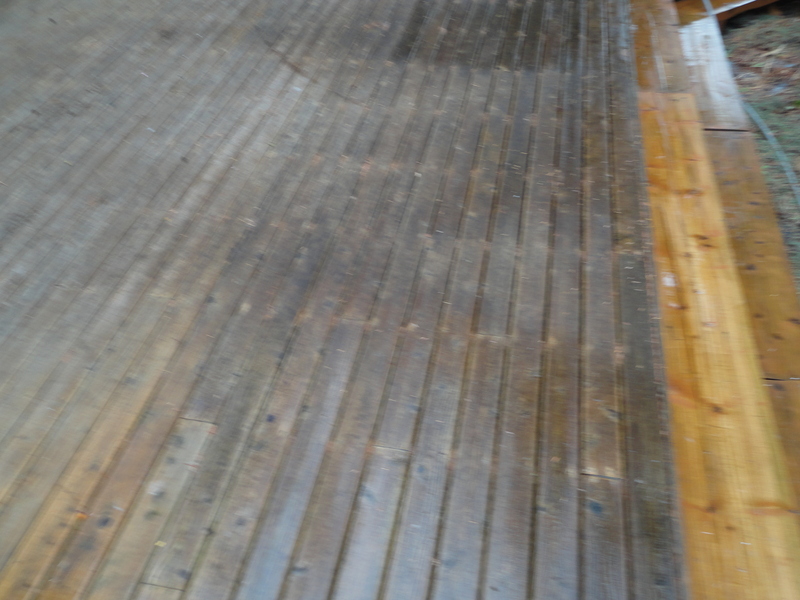 The restoration of this wood deck that had very little maintenance took 4 different chemicals and 6 hours. A dramatic difference from the photo above. This roof had moss growth over its entire surface. We manually scrubbed and then applied moss killing and stain inhibiting chemicals. Composition roofing is an inviting environment for moss growth in Seattle. Make sure to not destroy your roof while having it cleaned! We NEVER use power washing on asphalt/composition roofs. 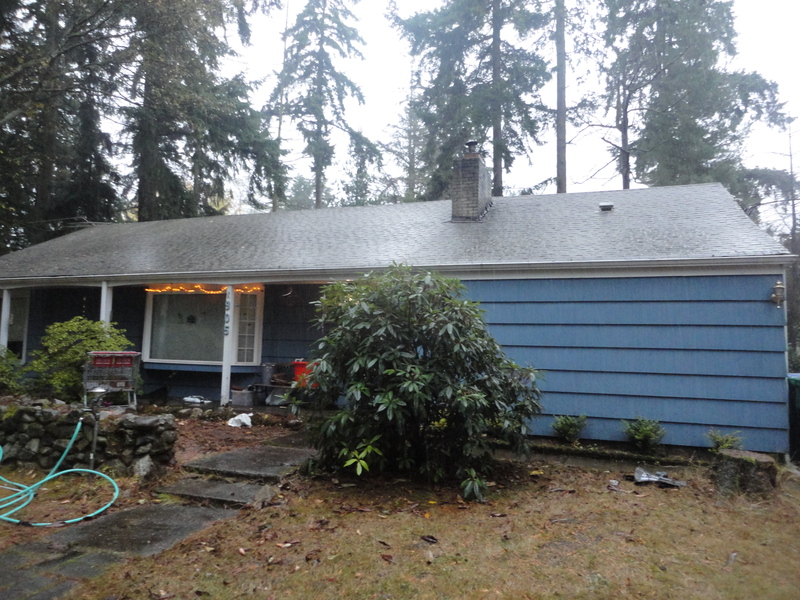 After manual scrubbing, a moss and stain removing chemical mix was sprayed on this home in Seattle. Using the soft wash roof cleaning method can clean a composition roof without destroying it. The difference in the pictures couldn’t be any more stark. All our roof cleanings come with a one year no moss warranty. 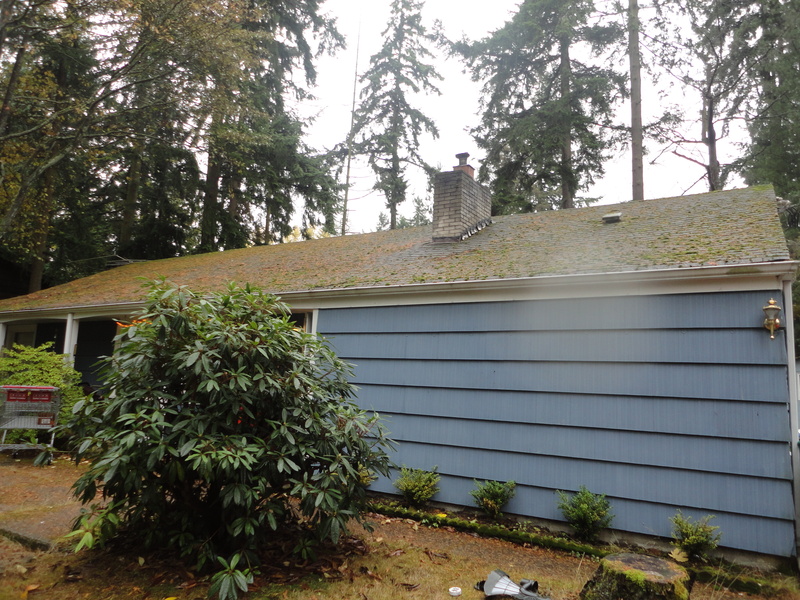 This roof in Bellevue, Washington was restored in a 5 step process. The roof was oiled to prevent cracking and warping during the cold winter months. Cedar roofs are some of the trickiest projects to undertake for a roof cleaner. Safety and using the right chemicals are serious concerns. The roof above was suffering from severe weathering and the photo above was snapped mid way during the cleaning process. After a thorough cleaning and acid wash this cedar roof was oiled to prolong the cleaning process. Oiling a cedar roof deflects the harsh winter months we face in the pacific northwest. Choosing the right products and adhering to a maintenance schedule can lengthen the life of your cedar roof in Bellevue, Washington. Trusting recommendations can go a long way in choosing the right contractor . We hope the photos above served as a reference to what we do. We have serviced over 200 clients in the last year and have many referrals upon request. Cedar is a great product to have as a roof covering. With a proper maintenance plan, the roof can last many years and even decades. Bellevue, Washington is home to many residences that have cedar as a roof covering. Many of these homes in Bellevue have shake roofs that are 20-40 years old! Blowing leaves and debris off the roof. Repairing damaged ridge cap and shingles. 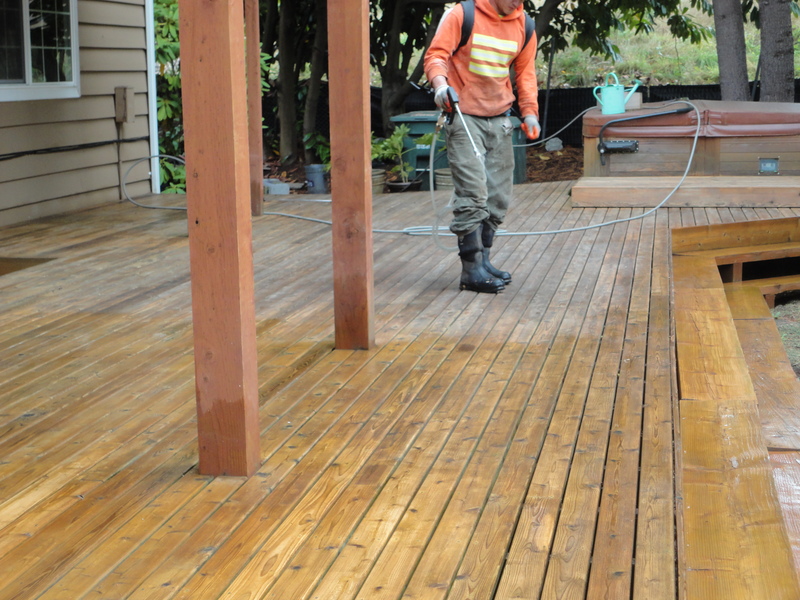 Periodic power-washing and cleaning of the surface of the cedar shakes. UV protection every 3-5 years. The application of moss killing chemicals or zinc ridge caps. Following a basic maintenance plan, can give you the full life cycle of your roofing. It may even prolong the roof way past its life expectancy. There is no method to restore a cedar roof in Bellevue,which has gone long periods of time without maintenance. When comparing the cost of a restoration to a having a new roof installed; restoration is also very economical.The cost of a restoration is about 10% of cost of a roof replacement. 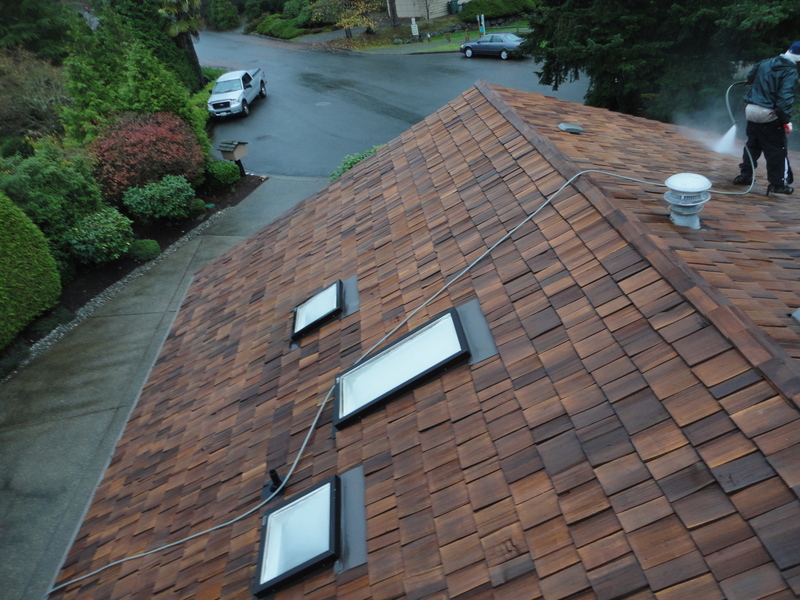 On average a 2500 square foot home with a cedar roof in Bellevue can be restored for about $2000 plus ridge and shakes. That same size home can cost upwards of $25,000 to have replaced. As you can see the benefits of restoring make a lot of sense. If you have questions on whether your roof is able to be restored or you just don’t like the look of greying, weathered and dirty Cedar roofing, give us a call. 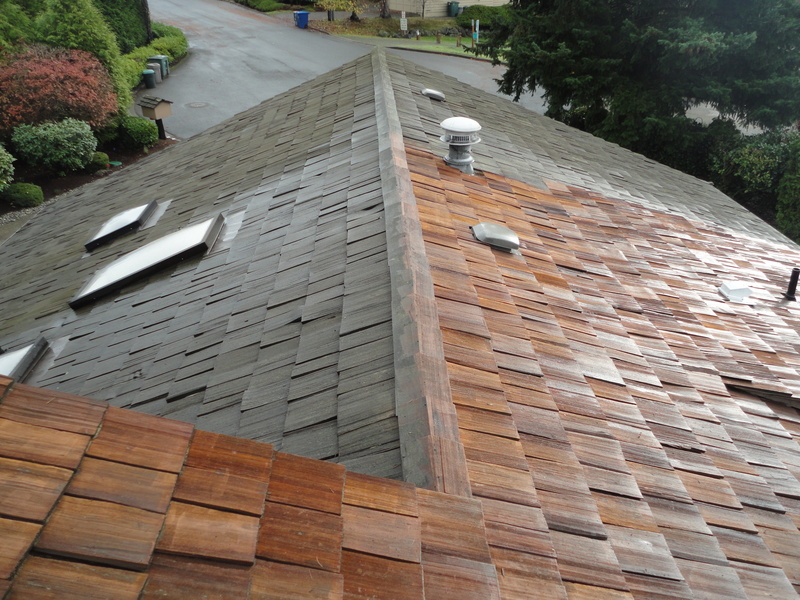 We are experts at cedar roof restoration in Bellevue. Different geographical locations require different types of care and maintenance for the home. For those living in the Everett, Washington area, homeowners may benefit from the use of soft wash roof cleaning over the use of harsher power washing methods. Read on to learn more about roof cleaning, Everett, Washington, and roofing companies that offer the soft wash cleaning method. The founding of Everett, Washington dates back to the year 1861 when a small group of settlers began building cabins in an area known as Port Gardner Bay. A few decades later, in 1890, when the Everett Land Company was incorporated, plans were made to form the town called Everett. The area is rich in history and is located 25 miles north of Seattle, with the climate being influenced by marine air masses. This causes the temperatures during the changing seasons in Everett to be less pronounced, than in inland areas. The soft washing method of roof cleaning incorporates the use of chemicals, which cause less damage to roofing surfaces than power washing. Roof shingles contain layers of granules which determine approximately how many years the shingles should last. As an example , a roof with a life expectancy of 20 years would contain 20 layers of granules. With every power washing procedure performed on a roof, 3 to 4 years can be taken off the life of the roofing substrate. This makes the soft wash roof cleaning method a more favorable option. Aside from this benefit, the soft wash method will last 2 to 3 years to keep moss and algae away. The softwash method works by eliminating all moss spores from the roof ,which cause moss to grow. TSP (trisodium phosphate) which removes rust stains and algae. Sodium hydrochloride which kills moss and cleans the shingles. Borax lo to kill moss residual and spores. Isopropyl alcohol to wipe out aggressive moss. Surfactant to stop the mix from flowing rapidly into your gutters. Only professional roof cleaners serving Everett, WA should attempt to mix these chemicals. The mixtures require exact quantities and not mixing these ratios correctly can cause damage to the property it is applied to. Choosing a local company can benefit your community by keep revenue in the area. We are proud to serve Everett, Washington with its roof cleaning needs. Our company is locally based and has served Western Washington since 2008. In that time we have performed over 60 roof cleanings in Everett. We are here to stay and look forward to many more years serving your community. There is a common misconception that bleach can kill moss. Homeowners go into their local supermarket and pick up a jug, pour it on their roofs and wonder why the moss hasn’t died. This information is faulty because, originally, store bought bleach only contained 6% of its weight as Sodium Hypochlorite [A.K.A Bleach]. There are many faulty ehow recipes on how to mix the bleach. By the time you’re done with even a conservative, 1 part bleach to 3 parts water your mixture isn’t strong enough to kill the moss you were after. Mixing household bleach which originally held 94% of its volume as water with even more water makes for a product that is not potent. Bleach is about $6 a gallon at this time of writing. It takes about 40 gallons of liquid to properly cover an average homes roof.The roof cleaning costs quickly add up. You now need a surfactant (something to stop the mix from rapidly flowing into your gutters), Dawn* soap or any surfactant able to mix without causing a reaction to bleach, work well. This is a surfactant that works well with bleach and doesn’t take away from its shelf life. Not Damage the roof it is applied to. Gloeocapsa Magma is the scientific name for those black streaks on your roofing. Gloeocapsa is a form of algae that lives in wet humid climates. These streaks of black are not as evident in the Seattle-Tacoma region due to the majority of roofing material being of dark coloring. If your roofing substrate is light colored , it’s very probable that these stains will be found on your home. Although, Gloeocapsa Magma is not harmful to roofing, the appearance of a home suffers tremendously. When selling a home the algae stains should be an issue that is dealt with before the home is placed up on the market. These stains are a red flag to potential home owners who may not know exactly what that black stuff is and whether or not it’s harmful to the roofing . Soft wash roof cleaning with chemicals is a superior method of removing Gloeocapsa. This method of roof cleaning gets rid of these unsightly black streaks while keeping the integrity of the roofing intact. Power washing is not as effective at eliminating Gloeocapsa. It is also very damaging to roofing shingles. Read more here…………. In the picture to the left, a chemical solution is sprayed on the roof. Each chemical in the mix does a certain job. Within 25 minutes, the picture to the right shows the roof stains are almost completely gone. The mix continues to work on the stains and streaks until the next day of rain. After the roofs first shower, the roof is looking its best. Going from being a white roof covered in black to being a white roof again has strong selling value for a home. 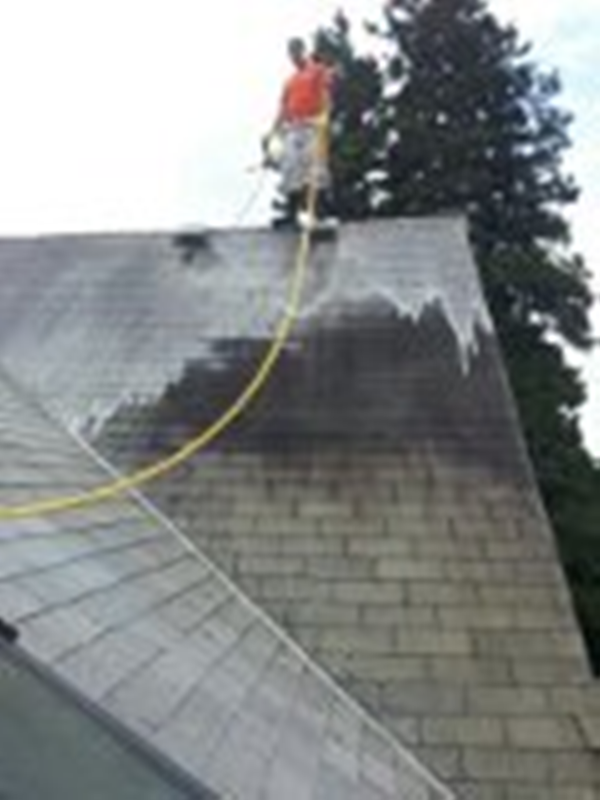 Soft Washing is a great way to safely and effectively remove black streaks from your roof in Seattle. Whether your home is up on the market or you just don’t like coming home to a dirty roof, consider chemical cleaning when hiring a roof cleaning contractor. Gas for Power washer: 75-85 dollars worth for a 3000 square foot home. The cost for a cedar roof cleaning quickly adds up for the company performing the task. Cedar roof cleanings require meticulous attention to detail. Every square inch is cleaned for the product to turn out right. The job is very labor intensive and requires a set of skilled eyes and hands. There is a lot to pressure washing a cedar roof and the right equipment and experience are necessary when deciding to tackle on the task. 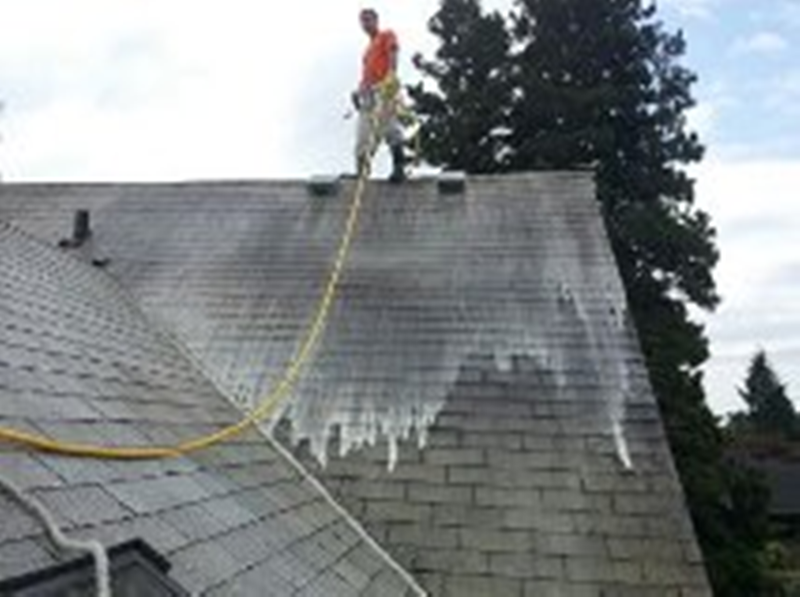 Many roof cleaners in Seattle won’t even touch a cedar roof as the liability for something going wrong is too high. Slips-Falls and improper use of a power washer can have serious consequences for the roof cleaner and the roofing substrate. If you are considering hiring someone to clean your cedar roof always make sure the company’s licensed, bonded and insured. Make sure to ask for references. Cedar roof cleaning is a task that requires many years to master and some of the best roof cleaners won’t try their hands at it. A 20 year roof has 20 layers of granules. A 50 year roof has 50 layers of granules. The elimination of all moss spores that cause moss to grow in the first place. ARMA [Asphalt Roof Manufacturers Association] recommends soft-wash cleaning for proper roof maintenance. ARMA is the association that governs the making of asphalt shingle roofing. They are the leaders in the industry in the production and proper cleaning methods of roofing materials. Sodium Hydrochloride 10% or higher: known for its ability to kill moss and clean shingle. Borax Lo: A soap like product known to aggressively kill weeds, spores and moss residual. Isopropyl Alcohol: used when aggressive moss has been growing for long periods of time. Surfactant: used to slow the mixtures path down to the gutter line. When mixed properly these chemicals generate a long lasting safe products to roofing material. These chemicals are not readily available to the average consumer and the mixtures of this chemical call for exact amounts for a strong enough product. The procedure of soft wash roof cleaning in Seattle is best left to a professional roof cleaning company. Categories: Roof Cleaners, Roof Cleaning Bellevue, Roof Cleaning Cost, Roof Cleaning Seattle, Roof Mold Removal, roof moss removal seattle, Soft Wash Roof Cleaning Seattle Tags: algae and lichen chemical, Bellevue Roof Cleaning, chemical roof cleaning, cost to clean roof, Moss Removal Bellevue, Roof Cleaning costs, roof cleaning quote, Roof Mold Removal Seattle, Roof Moss Removal, roof moss removal seattle, seattle roof cleaning company, what chemicals are used to clean roofs?